A 5 year, four university, multi-partner programme developing the knowledge tools and techniques to facilitate the transition towards a more sustainable industrial system. REDRESS is a collaborative project between M&S and the IfM and funded by the Innovate UK competition 'Supply Chain Innovation Towards A Circular Economy’. It is a 2-year project to drive garment recovery and retained value through business model and supply chain innovation. This project seeks to accelerate M&S Plan A commitments around reducing waste. The focus for this project will be to significantly reduce the environmental impact of raw materials in M&S’ clothing supply chain. The team is applying circular economy thinking and business experimentation processes to drive greater garment recovery and retained value. The outcomes of the project can be applied to textile and other industries.he project aims to improve overall sustainability of UK and Global manufacturing through the development of tools and methods to help reduce sustainability performance variation between factories and help elevate (future) factory sustainability performance. The RDM Studio is a feasibility study which seeks to address the key research question, “How can data-driven decisions predict a future RDM business model”. This feasibility study was funded as part of the RECODE Sandpit. The aim of this research is to develop a Digital RDM Studio that will enable data-driven experimentation with different business models for consumer goods industry. The feasibility study is a collaboration between IfM and Cranfield University researchers. For more information. 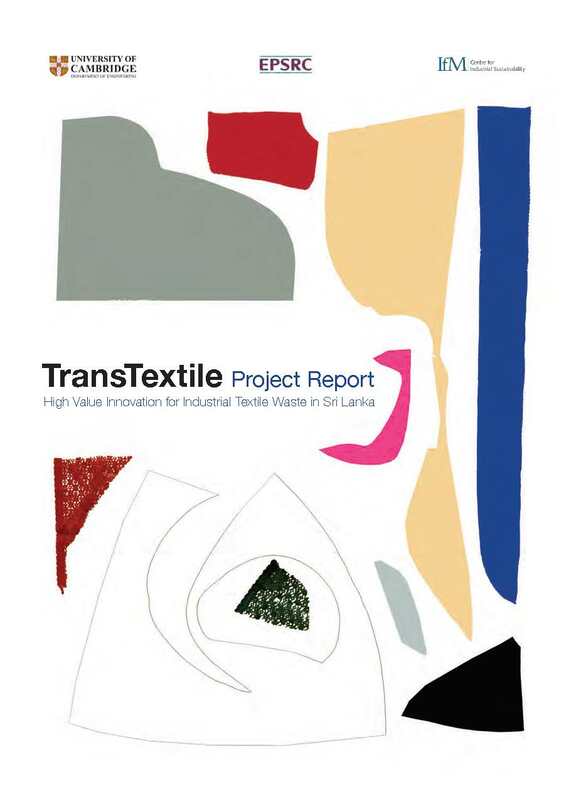 Funded by the EPSRC Global Challenge Research Fund, this project sought to transform Sri Lanka's apparel manufacturing waste streams into high value products through introducing innovative remanufacturing processes and designing new business models. The Centre's High-Value Business Tools were used to work with Sri Lankan apparel manufacturer, Expo Industrial Engineering (EIE). A collaborative, open innovation lab was built locally to conduct experiments and pilots with waste from its partner factories to contribute to the economy and society of Sri Lanka. Centre researchers scaled-up their experience and knowledge in up-cycle design which has been proven to create successful high-value products. Researchers also developed locally appropriate, innovative mechanical remanufacturing processes and shared social engagement know-how. The report has been spread to industry practitioners and has been successful in attracting several further collaboration opportunities. A feasibility study of the 3D printing idea has been applied in conjunction with a Canadian 3D printing start-up, while the UK business plan for the High-Press Fibre Panel has been shortlisted for the Cambridge Enterprise Business Competition. An expanded version of TransTextile, a creative innovation hub proposal for a wider range of industrial waste, is in application with Thammasat University in Thailand. Download the final TransTextile report here. The aim of this research is to develop knowledge and tools that will help those with a stake in manufacturing explore how their system might be configured in the future and how they can actively prepare for those challenges today. From the challenges of engaging with the circular economy, to the language which helps unlock industrial system design, from developing scenarios to understanding how innovation and value creation can be enhanced through relationships and experimentation, the researchers have engaged with industry and leading thinkers to develop knowledge and tools which can help manufacturers tackle these problems. The work has revealed insights about what approaches have the potential to move towards more sustainable industrial systems, and the collected knowledge from the group is being incorporated into a new programme for those who seek to lead change in industry, developing pioneering projects that lead a wave of change across the system.his project will examine the planning processes manufacturing firms use, and identify new techniques that will enable a shift in firm performance towards sustainability. By experimenting with new planning techniques we intend to build up visions of potential future system configurations and identify the interventions required at a system level to enable these.